The whole team of Adventure Alternative Nepal does its best to act sustainably. We would be grateful if you do too. Travel Lightly: Pack only the essentials, and don't bring things that will become waste. Terracurve states that 7,537 tonnes of carbon dioxide would be averted from going into the atmosphere each year if travellers reduced their luggage by 25%. 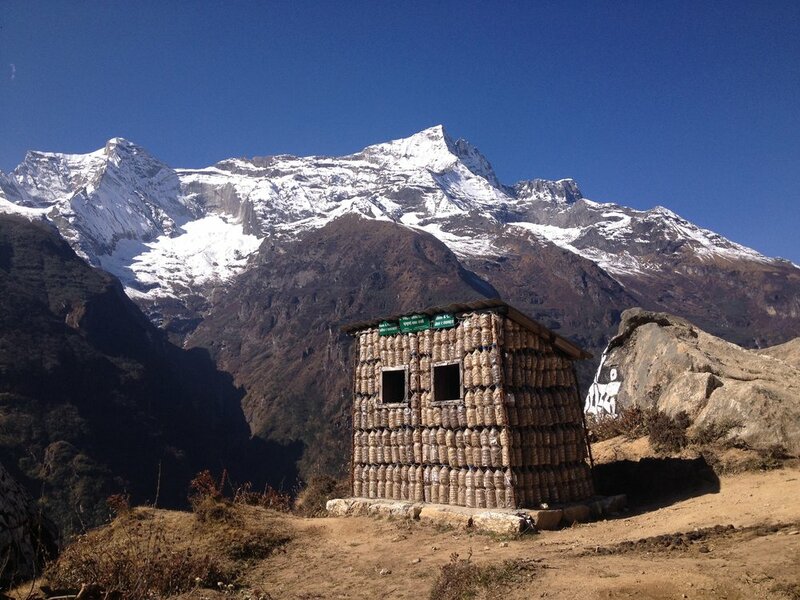 All expeditions pay a $4000 deposit which is lost if any non-biodegradable waste is left on the mountain. Recyclable goods are brought to the prescribed recycling facility in Kathmandu. Disposable items are brought off the mountain and deposited in front of the relevant authority. The Liaison Officer and the region’s village leader collaborate to enforce these procedures. Since 1994, Sherpas have been compensated for every discarded oxygen bottle that they bring down from the mountain. Glass bottles have been banned on the mountain since 1998. We try to avoid bottled water wherever possible, and encourage our clients to do the same. We do not bring bottled water on mountains due to waste; all water comes from rivers and glacial streams. Buy a Nalgene water bottle in prior your holidays / trekking and the staff will fill your water bottles every evening. The British Mountaineering Council estimated that over 200,000 bottles were discarded by tourists last year in Nepal’s Annapurna region alone. Moreover Plastic isn't just bad for the planet. It’s not good for you, either! Bottled water companies increasingly use BPA-free plastic, but laced into plastic bottles are other chemicals that can seep out if bottles are exposed to heat or sit around for a long time. Some of these chemicals are possible endocrine disruptors. No one knows for sure what the health outcomes are. Do you really want your body to undergo that experiment? So why don't you go and get a nice, durable and re-usable BPA-free bottle or even better a stainless steel bottle in whatever size, colour and design you like!? Filtered water is available in some of the Nepal guesthouses – a cheaper alternative to bottled water. If filtered water is not available, the best option is to order boiled water from the lodge kitchen to fill your water bottle in the evening. Please note that cheap water bottles easily split when filled with hot water! The other option is to use iodine drops (known as Lugols solution in Nepal and available in supermarkets). Further, please turn off the water during you brush your teeth and take short showers. If you are interested in knowing more about Adventure Alternative and the Sustainable Tourism.